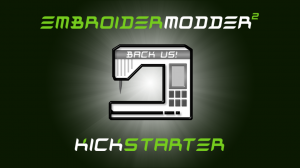 It’s been a long time coming, but the Embroidermodder 2 kickstarter is now live! Head on over to kickstarter and back this awesome project. If you don’t know much about embroidery software or were thinking about buying some digitizing software for your embroiderer, my wife and I were thinking about buying PE Design Next, which retails for somewhere around $1,000. It’s hard to get an exact number. I’ve tried. But this is open source — that is FREE — and cross platform — that is Mac OS, Windows, Linux, Raspberry Pi, and Arduino. I’m hoping to help out with the Mac OS and Linux ports once we get moved to our new house and settled in. It does lots of cool things already, including supporting TONS of embroidery formats, and with your help on Kickstarter, it will do much, much more!! !